This is a beer I had been coveting since summer, having started my beer journey after its availability ended. I thought I would have to wait until next January to try it, as it's only available for a month and a half at the beginning of the year. However, I was delighted to see it on the bottle list at the Blue Nile, an Ethiopian restaurant in Minneapolis. Why was this beer so sought after? For one, Bell's is one of the best breweries in the country, and its wide availability in Minnesota has allowed me to sample many of their outstanding options. Secondly, Imperial IPAs are without question my favorite style of beer to date. You get the intense hop taste on the front, with the monster alcohol kick at the back. You can usually sip them, enjoy the taste, and feel it at the end. True, a Hopslam is gonna set you back $7 or so, as most DIPAs will, but you get the equivalent of two beers in one tasty snifter. The color of the beer is the first key. This one was that beautiful deep amber--darker than the bug in the rock amber--sort of like a harvest moon color. That's a good sign. It's a color that just looks enticing. The aroma was phenomenal. Yes, there were the immediate hops that one would expect from a beer of this variety, and yes, there were citrusy notes that again, are expected. But there was a sweetness there as well. The beer is brewed with honey, and being able to find that scent in a powerful beer says a lot about the brewing. It smelled balanced. The taste. I'll refrain from going into any flowershop or produce aisle metaphors here, but my first contact with Hopslam was as good as any I've had. Again, the honey is crucial, as it balances out the roof-of-the-mouth dryness that comes with these bitter hops. It sticks to the inside of your mouth, but is wiped away by the sweet honey. Magical. 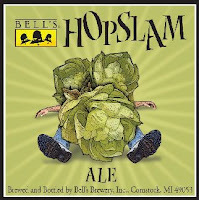 Without question, Bell's Hopslam was one of the three or four best beers I've had. I look forward to buying it in bulk come January 2009.